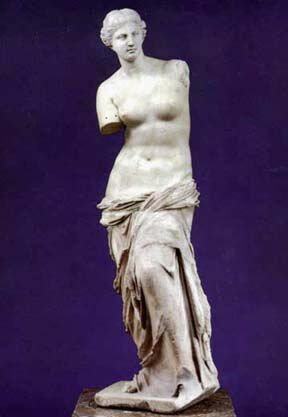 Venus de Milo by the sculptor Alexandros of Antioch-on-the-Meander, is one of the most famous pieces of classical Greek sculpture, easily recognizable by virtue of its missing arms. It is widely considered to set a standard of feminine The Capuan Venus is caught in a pose where Venus admires her reflection in a shield placed close to her knee, while she holds an Apple (the Apple of Discord) in her raised, left hand. One source says the arms were broken off when a French officer tried to buy the statue. Piper, David. The Illustrated History of Art. London: Bounty Books, 1981. 42-43. This page was last modified on 9 April 2019, at 19:01.